David Gustafson, a scientist with agricultural biotech giant Monsanto, was sweating a little. There he was on the stage at the 2014 Camden Conference, talking food policy for the future, but all the Mainers in the audience wanted to do was ask him questions about Monsanto’s past and present. He deflected neatly. He made a few self-effacing science-guy jokes, and he admitted that the company has not always been its own best public relations representative. Members of the audience, a mix of well-heeled types and students, grilled him. What are the moral implications of genetically engineering crops? What did Gustafson really mean when he talked about Monsanto’s effort to create “better seeds”? And what about the company’s reputation for suing farmers for patent infringement when, according to the farmers, their crops have been pollinated accidentally by Monsanto’s altered strains? IT’S NOT CLEAR precisely how much of Maine’s 1.5 million acres of farmland are planted with GMO crops annually. Manufacturers of genetically engineered plants and seeds must file reports with the Maine Department of Agriculture, Conservation and Forestry that include projections of how many acres could be planted based on what they’ve sold to Maine growers. Last year five manufacturers filed sales reports, the details of which are not released publicly. Here’s a look at the aggregate acreage. THE CROP ESTIMATES could include field corn, canola, soybeans, sweet corn and alfalfa. “That’s not who we are,” he protested. Gustafson offered that there were things Monsanto might be able to learn from organic farmers. He invited one questioner to come visit Monsanto in St. Louis. He acknowledged that the company has often failed to engage in conversation with critics. Many states, and nations, have big issues with Monsanto. Last May, protests dubbed “March Against Monsanto” were held in 52 countries. (Another rally is planned for May 24, and its Portland organizers hope to draw a crowd of 1,000.) The Food and Drug Adminstration, however, considers most genetically engineered crops “substantially equivalent” to non-GE crops, and while it doesn’t conduct its own health studies, it reviews industry research before approving genetically engineered plants. There’s no widely accepted scientific evidence to suggest that there are ill affects on human health from consuming genetically engineered foods, at least not in the 20 years they have been studied. Yet Maine’s history with Monsanto is particularly fraught. It has evolved over time from warning bells in the organic community and a welcome embrace from many farmers looking to improve their yields to something much more antagonistic: lawsuits, a labeling law and a public now deeply suspicious of or deeply confused about what this giant corporation does. In Aroostook County in the 1990s Maine farmers jumped on a bandwagon to grow Monsanto’s genetically engineered potato, the NewLeaf. The promises were great, as is often the case with genetically engineered crops – fewer pesticides or herbicides or fertilizers needed, all pluses for the environment.When consumer confidence eroded, causing potato processor McCain Foods to say it wouldn’t buy any more genetically engineered potatoes, the market dried up and Monsanto made a quick exit, leaving behind a research facility (now a part of the University of Maine Cooperative Extension) and causing setbacks or outright ruin for some Maine growers. Then, Monsanto sued Oakhurst in 2003 over its practice of labeling its milk as free of artificial growth hormones, which the maker of the primary growth hormone took as deceptive. The Maine company refused to roll over. In 2007, the state’s Board of Pesticides Control finally approved sale of seed for Bt field corn (that’s corn injected with a bacterial gene that makes it function as its own pesticide), the last state in America to allow what is one of Monsanto’s most successful products. More recently, there’s the story of those family farmers who sued Monsanto in 2011 to gain protection from being sued themselves, should Monsanto product blow onto their land and sprout. Many plaintiffs were involved, but the lead organization was the Organic Seed Growers and Trade Association. President Jim Gerritson is a potato farmer from Bridgewater, near Presque Isle, who doubles as a sort of walking Google when it comes to matters involving Monsanto. A passionate proponent of organic farming, he’s been suspicious of genetically engineered seed technology for nearly three decades. From the vantage point of far northern Maine, he has trained an eagle eye on Monsanto, keeping track of any and all potentially nefarious activities and become a national leader of the movement in the process. Last year, Maine was the first state to pass a law requiring that products containing genetically engineered crops, the vast majority of which are Monsanto-made, to be labeled as such. The agriculture committee spent weeks trying to understand the science behind the issue before siding with the people’s right to know. It passed by a wide margin, but the bill included a trigger clause that rendered it moot unless New Hampshire and three more contiguous states passed similar laws. Even the Maine Farm Bureau, which had opposed labeling in November 2012, came around and supported it last year. In April, Vermont became this first state to pass a labeling law free and clear, without dependence on its friends and neighbors. The tide of public opinion was turning. Had Gustafson been nervous, paying Maine a visit so soon after passage of the GMO law? “You’ll think this is disingenuous, but I had actually forgot about that,” he said. When the Maine Food Strategy, a coalition of policy groups and individuals, polled Mainers last fall about how concerned they were about transgenic or genetically engineered crops, 24 percent ranked it a 10, of highest concern. Jemison’s perspective may be unexpected, given that he had a moment of fame back in 1999 when one of his research projects was the victim of either a very pointed prank or eco-terrorism. Jemison has been a soil and water quality specialist with the University of Maine Cooperative Extension since 1991. He was researching corn that was genetically engineered to be able to thrive even if everything around it was doused in Monsanto’s breakthrough product of the 1970s, the herbicide glyphosate, commonly known as Roundup. Jemison’s goal was to find ways to keep pesticides out of groundwater, and if the insecticide was within the plant, that would mean less spraying needed outside the plant. He also hoped this corn might work for Maine farmers plagued by the state’s one perennial grass, quackgrass. On an August night in 1999, rows of corn he had planted were chopped down in the night. Jemison never found out who cut down the corn, but he understands the motivation behind the crime. His research was valid and shouldn’t have been tampered with. But he also knows that a lot of opponents of genetic engineering believe that researchers are bought and paid for by companies like Monsanto. They probably saw him as the enemy – even though he’s the guy who would always buy organic corn for his family, given the choice. If organic isn’t offered, he’d take Bt corn over that heavily sprayed conventional corn. And since those early, controversial studies, he has come to the conclusion that genetically engineered crops only give Maine farmers the edge one year out of five; you can’t engineer your way around bad weather. In the 1980s Monsanto evolved from primarily a chemical company, making products like Roundup, into the field of biotechnology. The company is now the dominant force in the controversial world of genetically engineered plants. That term “genetically engineered” or GE, is used interchangeably with “genetically modified organisms,” or GMOs. The terms mean the same thing, but the former is preferred by the Food and Drug Administration and scientists. What it means is that proteins from one species are combined with another to create a new form of corn or say, a papaya, that is resistant to potentially damaging factors like pests, disease, cold or heat. In the case of NewLeaf potatoes, trumpeted by Monsanto in Maine newspapers as the salvation of the potato industry as early as 1995, that gene was a soil bacterium, Bacillus thuringiensis, which causes the plant to act as its own insecticide to ward off the potato beetle. It worked, but genetically engineered french fries made consumers nervous. Which in turn made companies like McDonald’s nervous. The market for the potatoes shriveled and, by 1999, Monsanto pulled the plug. But there were still potatoes in the field. “It always seems like the little farmer that doesn’t have the insurance ends up holding the bag,” he added. But consumer preferences played the predominate role in the potato fiasco, he noted, not Monsanto’s business practices. And even a grower in Aroostook County who not only grows no genetically engineered crops but is celebrated for that, isn’t ready to damn biotech. It’s a popular argument, and it stops many people in their tracks; who doesn’t want to help hungry people eat? “The starving masses,” Gerritson, the Bridgewater farmer and activist, said ruefully. “With the golden rice.” He was referring to a vitamin-enriched, yellow-tinged rice engineered by the International Rice Research Institute, with the help of a former Monsanto executive, to address malnourishment that was tested in the Phillippines and China. But the Internet is aflame with information and opinion suggesting otherwise, or pointing out that the 20 years we’ve had these plants around isn’t enough time to draw real conclusions. It’s that confusion and complexity that has attracted Portland writer Caitlin Shetterly to write about GMOs on a bigger scale. A controversial piece she’d written in Elle magazine about her health issues and GMO corn landed her a book deal with Putnam. She’s deep into the project now, having traveled to California, Europe, the Great Plains and Northern Maine for research. The debate should be a nuanced one, she said, and it’s one in which the state could play a pivotal role. Maine is hardly alone in having a citizenry concerned about Monsanto. 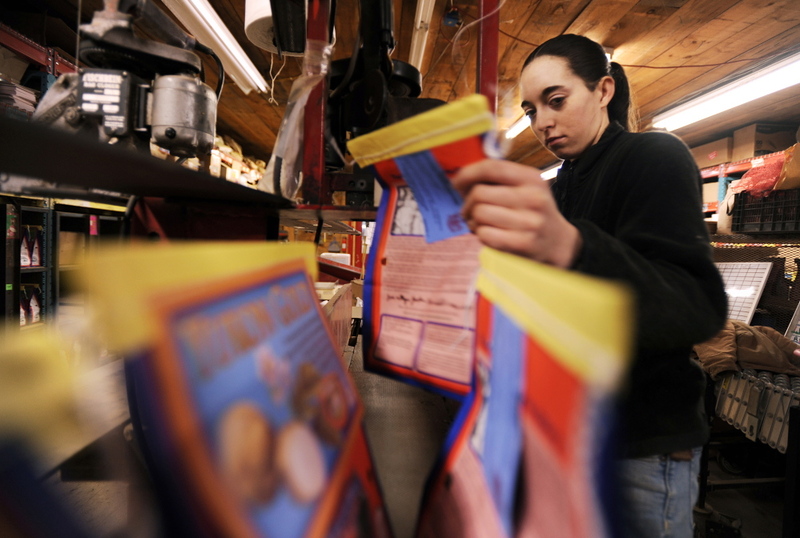 Connecticut passed a similar GMO labeling law, also with a regional trigger clause. Similar measures were defeated in California and Washington. Last November, Hawaii banned biotech companies and new GMO crops from the Big Island. Unless federal legislation proposed in April, the Safe and Accurate Food Labeling Act, blocks state efforts. The bill would prohibit labeling of genetically modified foods unless the Food and Drug Administration found them to be unsafe or materially different from other foods. Although it has bipartisan sponsorship, its chances of passing are not considered good given the court of public opinion. Even with the groundswell of GMO opposition in the states, Whitley Nabintu Marshall, president of the Green Initiatives Fund and an organizer of this year’s March Against Monsanto in Portland, says there’s much to be done. “Part of our goal for this rally is to keep the conversation going,” she said. Like Shetterly, Marshall, who is married to Portland City Councilman David Marshall, sees Maine as a nimble and willing player in the American campaign against Monsanto. When she asked farmers at the Portland Farmers Market if she could distribute pamphlets for last year’s March Against Monsanto, all but two agreed. “That tells you a lot about the mindset of our farmers,” she said. Certainly that’s true of growers who go to farmers markets in Maine’s urban areas, as well as those who belong to MOFGA. But the state is neither a monolith – Aroostook County is its own animal, politically – nor is it free of genetically engineered crops. In 2011, the Maine Legislature began requiring genetically engineered seed manufacturers to submit annual reports to Maine’s Department of Agriculture, Conservation and Forestry of potential acreage that could be planted based on their sales in Maine. 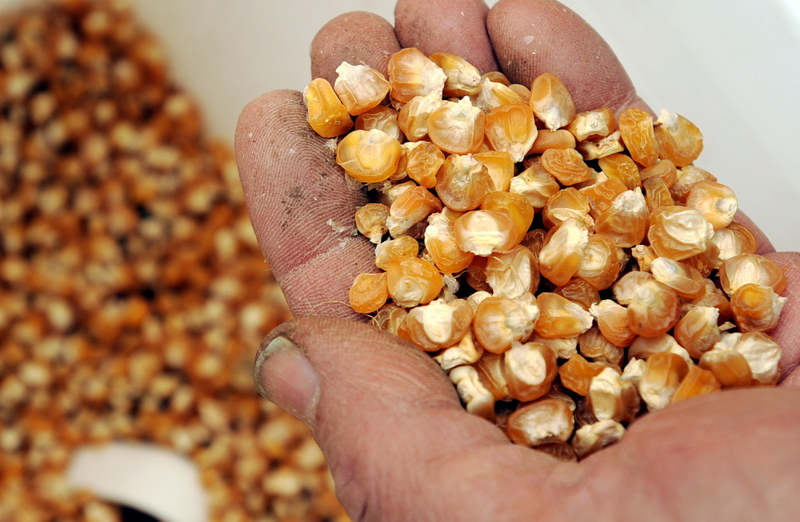 Five manufacturers reported data – which is considered confidential under the law and not broken down by crop – for sales of seed for field corn, sweet corn, canola, soybeans and alfalfa. In 2009, the aggregated data showed 17,039 acres of Maine farmland might be planted with genetically engineered crops. By 2013, the figure had risen to 28,210 acres. For perspective, according to the USDA Farm Census, Maine had 1.455 million acres of active farmland in 2012. 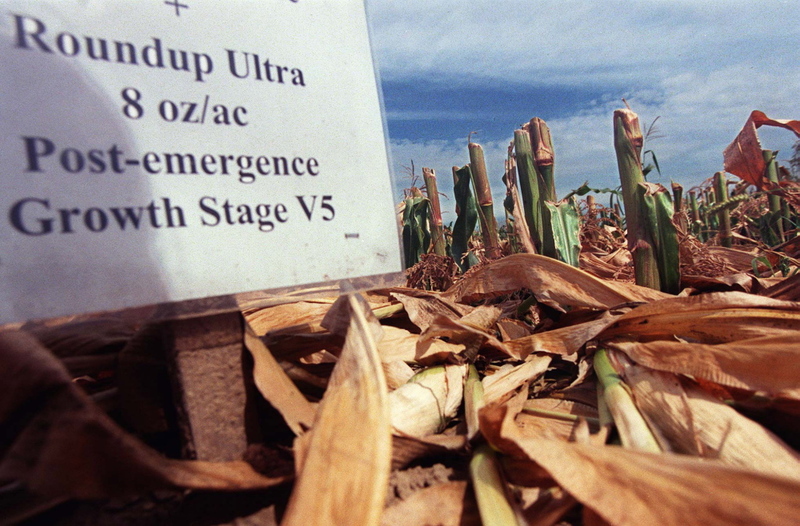 About 2 percent of what Maine farmers grow might then be genetically engineered. “It’s a safe bet that if it is a soybean grown in Maine, you can guarantee that 90 to 95 percent of it is Roundup ready,” said the Extension’s Jemison. Crops aside, to be completely free of the presence or influence of Big Agriculture’s biotech giants, like Monsanto, would be nearly impossible. The grocery stores are full of products made with corn syrup from Monsanto’s trademark pest-resistent corn. And the Monsanto name turns up in surprising places. As part of its corporate outreach, Monsanto provides funding to groups for possible future farmers. In Maine, the company donated up to $1,000 a year to the 4-H program for volunteer development. While the company still funds programs in 39 states, the Maine donation stopped about four years ago. Monsanto’s charitable giving is one of the reasons it is regularly honored as one of the “100 Best Corporate Citizens” by CR Magazine, which chronicles trends in corporate responsibility. Monsanto was No. 38 on the 2014 list – seventh based purely on philanthropy. Jim Gerritson is perhaps, of all Mainers, most immune to Monsanto’s charms. He sells potato seed as well as growing for market. When he’s processing seed orders, anything from St. Louis, Monsanto’s hometown, gets an automatic flag; he doesn’t want them getting hold of his product. The lawsuit he led via the Organic Seed Growers and Trade Association against Monsanto brought both victory and defeat. In January 2014, the U.S. Supreme Court declined to hear the group’s appeal asking for pre-emptive protection and attempting to invalidate Monsanto’s GMO patents. But a three-judge panel at the Court of Appeals for the Federal Circuit, had, in June 2013, ruled that Monsanto had to stand by assurances that it would not sue where trace amounts, less than 1 percent, of its genetic material could be found on farms that had not paid for the Monsanto seed. That amount is too small for Gerritson. “When it comes to agriculture, when we get contaminated by chemicals or (genetically engineered) material, it’s like saying, ‘You didn’t have a big enough lock on your front door,’” he said. He declines to say what legal steps the association might take next, if any. Keep your enemies closer doesn’t apply in this case. He’s working with New Hampshire proponents of GMO labeling. A bill there seems to have died a quiet death in committee, but with the November elections, another will doubtless turn up. Vermont represents a victory. So do more Marches Against Monsanto to spread awareness. “We have always felt that we need to have multiple strategies for dealing with the threat of GMOs,” he said. He’ll push on, planting his organic potatoes this spring, and keep an eye on those seeds of change he’s been cultivating as well. They seem to be thriving.